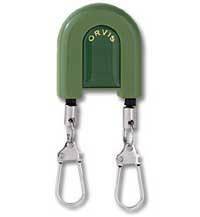 These anodised machined aluminium Orvis fly-fishing nippers boast smooth mechanical performance. Not your ordinary nippers. 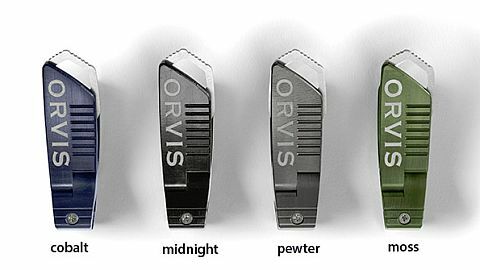 Made in the USA of machined 6061-T6 aluminium, these Orvis fly-fishing nippers incorporate a piano style hinge that adds mechanical advantage for easily cutting anything from 80 lb to 8X tippet. Replaceable Crucible CPM S35VN cutter and anvil. Ergonomic contour for comfort and enhanced function. Type III military-spec anodised. Made in USA. Keep your pack tidy with this handy fishing accessory. 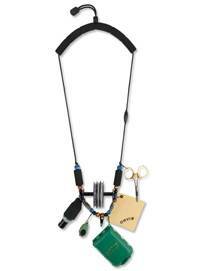 Collect and store your bits and pieces of tippet quickly and easily. No more lengths of tippet sticking out of every pocket, or accidentally ending up in the water or streamside. Compact, lightweight, and reusable. Just put the end tag in the slot and twist to wind it up. Fishing accessory hangs on vest. When tool is full, pull on bottom, cut tippet, and remove from spindle. FFF endorsed. 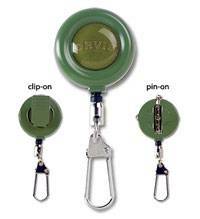 Carry this fly fishing zinger with carabiner in the field and never estimate again. 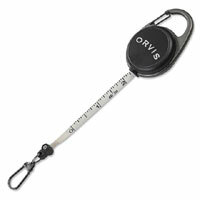 High-quality tape measure featuring two different attachment optionsa simple belt clip or a carabineer. The zinger itself also functions as a measuring tape made from a high quality waterproof polyester material. Sturdy clip on the end of the zinger holds your tools. Both US and metric measurements. Black nickel finish. 40" tape length. Quickly dry your flies with this large, luxury quality, thick amadou fly dryer. Sleek new look for our classic zinger retractor. 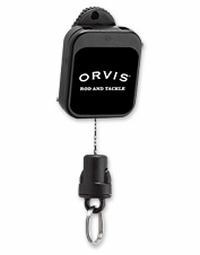 Invented by Orvis years ago, this handsome new Black Nickel Zinger will hold any number of tools for easy and immediate access. Comes in pin on and clip on. Sturdy all-metal construction, with a coated wire cord. 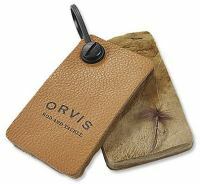 Orvis's ripple foam fly drying patch is an essential fishing accessory. Can be attached to vest or pack with Velcro, pin or clip. Fly fishing accessory in black. 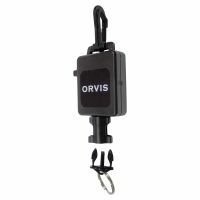 2½"W x 4"H x ¼"D.
Orvis's smallest wire cord zinger pins in place so gear is always where you need it, but never in your way. Employ several Micro Zingers to ensure ample storage for all your critical fishing accessories. Length of cord 15". Measures ¾" in diameter. An ergonomic lanyard crafted in the USA. Adjustable foam neck strap with breakaway feature for safety. May come in black, blue, green, or natural beads. Tubular foam fly patch on both left and right side, vertical tippet carrier, floatant caddy, chamois, 2 tool snaps, and a bottom clip to secure to shirt. During the season, a stream thermometer can tell you when salmon will run. Salmon start to run at 30°F, at 40°F they will negotiate obstacles, but between 50/60°F they will be most active. Our indispensable fly fishing thermometer has a flat black metal housing for non-glare protection, a clip for attaching to your pocket, and a split ring for attaching to a lanyard or pin-on reel. 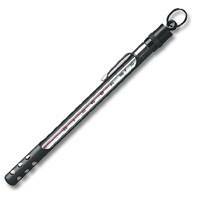 Fly fishing thermometer measures both Fahrenheit and Centigrade. 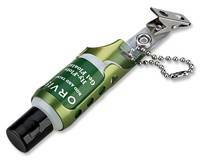 Just drop the floatant bottle into this fly fishing accessory and you're ready to go. No need to remove the cap from bottle, insert into caddy and replace cap as with other holders. Fly fishing floatant accessory is made of light and strong aluminum. Small chain or clip attachment. 5 oz.  Keep two fly fishing floatants on hand in one handy pack. 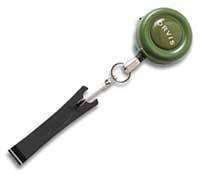  Swivel clip attaches quickly and securely to your vest. 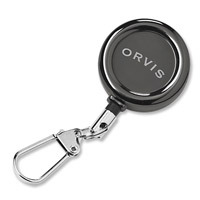  Includes one container each Orvis gel and powder floatant. Our classic zinger. 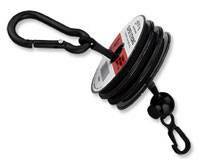 Virtually unbreakable 15" nylon-covered woven wire cord. In pin-on or clip-on styles. Independently fasten two accessories with one high-quality, pin-on wire cord zinger. Ergonomically designed nipper in three trout skin colours, brook, rainbow, and brown. Much easier to grip and use than standard nipper. 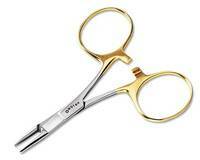 Super-sharp stainless cutting jaws can handle even the smallest tippets. The larger size and rubber padding on the handles of our new snips make them easier and more comfortable to use. Clean snipping of tippet for easy threading of hook eye. Handy eye hook cleaner. Cutting jaws stay sharp and aligned. Needle cleans the eyes of flies. In silver or black. 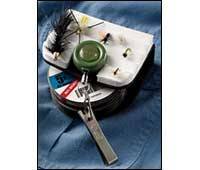 Hold three 40 or 100 meter spools of tippet just behind your essential flies and a ripple foam patch with zinger: Everything you need pinned to your fly vest or use the lanyard. Two-piece leader straightener has twin rubber pads. Also removes unwanted glare from your leader. Finished with a durable leather cover. Without wire cord zinger.